Outposts have a number of uses other than what they are originally built to do. You can station your squads at them and launch attacks from outposts. You can also relocate your colony to one of your basic outposts. 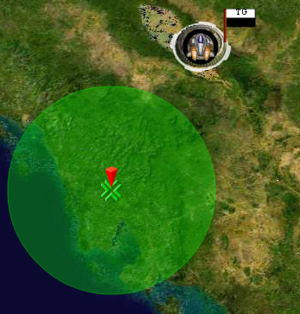 After an upgrade, they can also provide radar coverage from radar outposts which have a 10-tick radar radius. Once you have 500 , 300 and 15 you can build yourself an outpost. 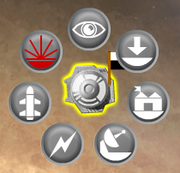 To build an outpost, click the Build Outpost button at the top-right of the interface. 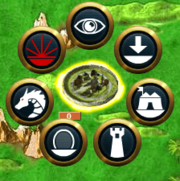 With different power levels, you can build different amounts of outposts. Ex. If you have 10 power, you built 2 outposts and captured another one, then you can build at most 3 more outposts. Building an outpost is similar to building your colony. You have to choose a site which is not on water and a bit of a distance away from anyone else (including YOU!) and all other outposts. On Fantasy worlds, you can't build outposts on forests or mountains either. If your mouse is too close to another outpost/colony or it's too close to water/forest/mountain, then the circle will turn red. Move your mouse until the circle is green. Once you've chosen a site, the outpost will be built straight away. You can send squads to defend it, but enemies can also attack it. After 24 ticks of control, you can then upgrade your outpost or raze it for a camp. Any normal outposts you possess will have a -0.5 upkeep which affects the amount of workers you gain every 24 ticks. So every two outposts you own decreases your worker production by 1 worker. In contrast bonus outposts increase the entire alliance's income by 0.5 upkeep per bonus outpost, so for every 2 bonus outpost your worker production increases by 1 worker. Once the option to raze s selected, you can NOT cancel the razing process. It takes 3 ticks to complete the razing cycle. Hostile squads can still capture an outpost that is being razed, if it lands on the tick the outpost finishes razing or earlier and wins. At this point the outpost would not continue razing. You must have 24 control ticks to raze an outpost. Razing the outpost while it still has squads or spies on it, moving to it (including hostile squads), or moving away from it; will result in the outpost becoming camp. You receive the resources at the end of the razing period, and then the outpost disappears or becomes a camp. A tactic used by some players to gain resources is to capture other player's outposts and then raze and/or downgrade them after 24 ticks to gain the resource reward associated with it. To prevent this from happening to you, make sure to be watchful of incoming attacks on your property. Camps are outposts that cannot be built or upgraded. They appear when an outpost is razed while it still has incoming, outgoing, or stationary squads/spies attached to it. In this sense, units and spies are always attached to some kind of target, and when an outpost is razed a camp takes it's place until no squads or spies are attached to it, at which point it will disappear. Some strategies include surrounding your colonies with camps so that the enemy must launch attacks from further away as any camps near your base they take cannot be used to send further attacks. Note: Camps also appear when a colony is deleted if there are crystals on it or if any squads are on it or moving to/from it, spies and nukes count as squads as well in this case. 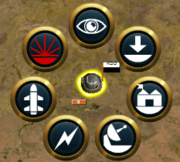 When you click on any undeveloped outpost, 7 bubbles will appear. Information on Resources Outposts can be found on it's own page. This page was last modified on 8 January 2013, at 20:56. This page has been accessed 53,843 times.